This is a fishing report from a 7 year old boy that went out on a fishing charter for making great grades in school. I am going to write the report from his paper. I think you should fishing with Captain Jim Lemke because he will help you with every thing. If you are having trouble and Capt Jim Lemke is doing something his son Kyle which is 16 will help you with it. I’m Evan Jacobson and i caught 15 Trout and 47 Redfish and I’m only 7 years old. I had a blast of fun with Capt Jim Lemke just tell him any kind of fish to catch and you will catch that fish. This is a link to his report that Evan sent me. have seen over the past few years. Big schools of Redfish are roaming almost every flat. The Snook are along the shoreline at low tide, the mangroves when the tide gets high. Artificials and live baits are working well. Soft plastics in natural colors seem to work the best. When working the flats, I also have been catching lots of trout, jack crevalle, silver trout and ladyfish. Tip: Bait is still on the bay area flats in 1-4 feet and at the Skyway. As the water continues to cool, the fall and winter bite will only get better. Jim Lemke charters out of Tampa, St. Petersburg and Clearwater and can be reached at (813) 917-4989 and at captjimlemke@gmail.com. What’s hot: With the water temperature dropping to the low 80s, snook, redfish, and trout are moving slowly to winter haunts like the canals around Apollo Beach, Simmons Park and Bishop Harbor on the south shore. On the other side of the bay, fish areas like Weedon Island and the American Legion flat. North of the Gandy Bridge, fish the docks in the Culbreath Isles area. And north of the Courtney Campbell, look around creek mouths and the canals. Don’t count out night fishing at those same areas with dock lights. 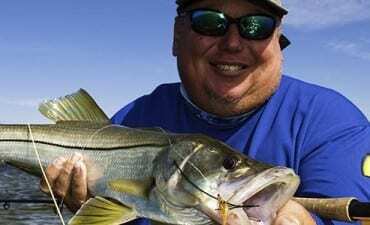 Tip: A good way to cover a lot of ground is casting a gold or silver spoon or a jerk bait. If you have a livewell, catch bait and go to the desired area. Throw a handful or two out and see if any fish pop the bait. Tampa bay is consider by many as the toughest place to catch a redfish on fly. It seem quite appropriate that the largest saltwater fly fishing event in the US is held right here in Tampa Bay. The Salty Fly 2013 presented by Hell’s Bay Boat works had a full roster of 80 teams that sold out in 41 minutes of open registrations. We had a waiting list of 45 teams that did not make it on the roster this year. We had anglers who traveled to the Salty Fly from the Cocoa Beach, Miami, Jacksonville, and the Florida Keys. Out of state participants came from Texas, Georgia, Massachusetts and as far away as Oregon. We had fly anglers from beginners to seasoned veterans competing for the gold. Factory reps and sponsors were also present to do a some networking as well as having some fun getting some fishing time in. The three months of anticipation concluded at Little Harbor resort on Saturday Feb 23rd 2013. If the tough spooky Tampa red fish wasn’t enough to contend with, the anglers battle cloudy skies, and 15 mph winds for the first part of the morning. In the afternoon the skies cleared up allowing for some sight fishing finally. When it was all said and done, the size of the fish this year were bigger than ever. The winning total of two red fish one trout by Team Slayer, Chris Cenci and Cody Chivas came out to 82.5 inches. This won them cash and prizes but mostly bragging rights for the being the top dog of the biggest saltwater fly tournament in existence. The runner up team of Conch Republic made up of Fred Hannon and Justin Cauffman hit a respectable 73″ mark. Rounding out third is team Carbon Marine with Joe Welbourn and Dave Preston with 71.25″. Congrats to all the teams and especially our sponsors for making it all happen. 2014 the roster opens to 100 teams and promise be bigger and better than ever. Mark it on your calendar Feb 21st to the 23rd 2014. Strip and Feed research with 4th place finish.